Droune (pronounced "droon") is an experimental tonal drone ambient project. [album one] was originally released in 2003 on Nepenthacea, it has just been remastered and re-released as droune1 as the first release on new label Restless Grey. Droune creates tonal drone atmospheres and dark ambient textures in a similar vein to some of Dead Voices on Air and Zovient France's work, as well as Robert Rich's Trances/Drones. Occasional live sets over the years have sometimes featured guests like Victoria (adding sparse vocal passages and woodwind sounds), and Kris (theremin), lending a new feel to some of the original pieces, as well as some new ideas. droune1 and two livesets are currently available for listening and download on Bandcamp and CD Baby. Droune is also on Facebook and ReverbNation. +02.14.17. The remaster/reissue of Droune's first album has been released. A 100 copy limited run CD (with new cover artwork by Lisa Wood) and name-your-price download are available now on the Droune Bandcamp page. +12.05.16. [album one] will be remastered and re-released in 2017. Work on [album two] is slowly evolving and will also hopefully see release sometime later in 2017. 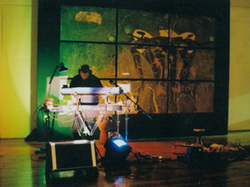 08.30.07 at Time Machine) and have just added them for streaming/download on Bandcamp. +02.04.13. New live page added.